"This technique allows us to control the metabolism of cells in an unprecedented way," said co-lead researcher José L. Avalos, an assistant professor of chemical and biological engineering and Princeton's Andlinger Center for Energy and the Environment. 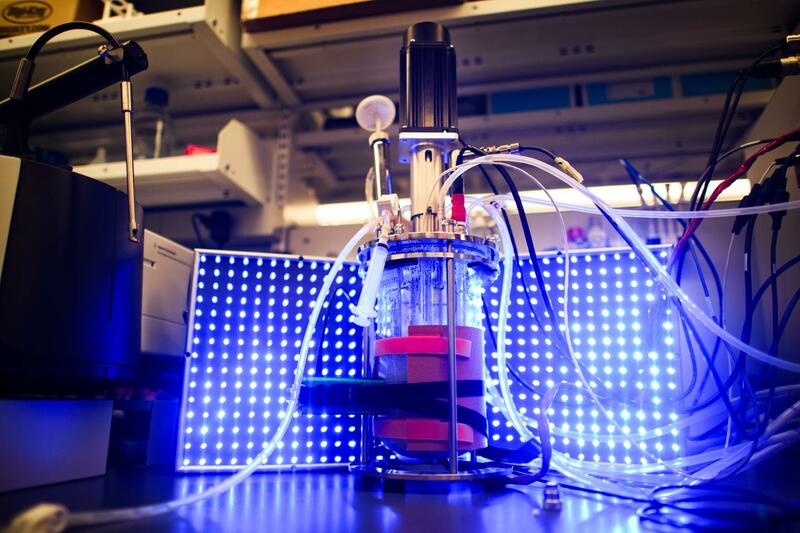 "It opens the door to controlling metabolism with light." The achievement of producing these chemicals was significant, but the researchers were intrigued by the development of light's broader role in metabolic research. "It provides a new tool with the ability to do sophisticated experiments to determine how metabolism works and how to engineer it," Avalos said. In a March 21 paper in the journal Nature, the researchers reported that they used light to increase yeast's production of the chemical isobutanol as much as 5times higher than previously reported levels in peer-reviewed studies The researchers used a genetically modified strain of the yeast Saccharomyces cerevisiae in the experiments. "Yeast don't want to make anything but ethanol; all their systems have evolved to do this," said Evan M. Zhao, a third-year Ph.D. student in Avalos' lab and lead author on the Nature paper. "This has been an age-old problem." The researchers sought to overcome this barrier. They managed to suppress the yeast's evolutionary self-interest by genetically engineering it to produce large quantities of isobutanol. But they faced a major problem. Isobutanol is toxic to yeast and eventually kills yeast colonies that produce it in any significant quantity. The researchers predicted they could use a combination of genetic engineering and light to fine tune isobutanol production. Using their light-switch technique, the researchers set out to keep the yeast alive while maximizing isobutanol production. The researchers started by putting a modified gene from a marine bacterium that is controllable by blue light into yeast's DNA. They then used light to turn on a chemical process that activates enzymes that naturally allow yeast to grow and multiply by eating glucose and secreting ethanol. But while those enzymes are active, ones that influence the production of isobutanol can't work. So the team turned to darkness to switch off the ethanol-producing enzymes to make room for the expression of their competitors. "Normally light turns expression on," said Jared E. Toettcher, assistant professor of molecular biology and co-lead researcher, "but we also had to figure out how to make the absence of light turn another expression on." The challenge was to find the right balance of light and dark, given that yeast cells die when their natural fermentation process is disturbed, Zhao said: "The yeast get sick. They don't do anything anymore; they just stop." "Just enough light to keep the cells alive," said Toettcher, "but still crank out a whole lot of product that you want, which they produce only in the dark." Using light to control yeast's chemical production offers several advantages over techniques involving pure genetic engineering or chemical additives. For one, light is much faster and cheaper than most alternatives. It's also adjustable, meaning that turning it on and off can toggle the function of live cells on the spot at any point in the fermentation process (as opposed to chemicals, which generally can't be turned off once they are added.) Also, unlike chemical manipulators that diffuse throughout a cell, light can be applied to specific genes without affecting other parts of the cell. Optogenetics, as the use of light to control genes is called, is already used in neuroscience and other fields, but this the first application of the technology to control cellular metabolism for chemical production. Gregory Stephanopoulos, an MIT chemical engineering professor who was not involved with Princeton's research, called it a turning point in the field of metabolic engineering. "It offers a brand new approach to the control of gene expression in microbial cultivation," Prof. Stephanopoulos said. The work and resulting paper were the culmination of interdisciplinary collaboration between Avalos's and Toettcher's labs. "Within our first month we wanted to use light to control metabolic engineering," Toettcher said. "We intend to keep pushing," Avalos said. "But metabolic engineering transcends industrial microbiology. It also allows us to study the metabolism of cells for health-related problems. You can control metabolism in any context, for industrial biology or to address medical questions."